Former First Lady Michelle Obama's book is getting a big reaction, not only from her fans but also from President Donald Trump. NBC 5's Mary Ann Ahern has all the details that have the country talking. In "Becoming," Obama shares such deeply personal revelations as suffering a miscarriage and sharply criticizes President Donald Trump for promoting the false "birther" rumor that Barack Obama was not a U.S. citizen. The former first lady's book comes out Tuesday and is among the most anticipated political memoirs in years, topping Amazon.com's best-seller list throughout the weekend. Winfrey, publishing's most established hit maker, knows the Obamas well, to the point where Michelle Obama and Ellen DeGeneres once teased each other over who was closer to her. Winfrey was a prominent backer of Barack Obama's candidacy in 2008 and has interviewed both Obamas over the years. 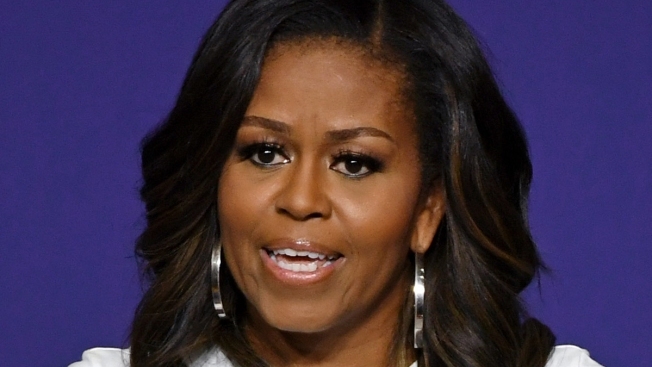 She is scheduled to be onstage Tuesday night with Michelle Obama at Chicago's United Center, the first stop on Obama's promotional tour. Winfrey has already taped an interview with Obama, which airs Thursday on the OWN network, and excerpts of the book will appear in O, the Oprah Magazine and in Elle. A two-part podcast will run Thursday and the following Monday, Nov. 19.